Derby Manager is a real time mobile casual game that allows players to raise top ranking race horses to bet on and win rewards to enrich their own horse ranch. Starting the app will begin an in depth tutorial that introduces you to all the sections of Derby Manager. To start the player can purchase on horse. 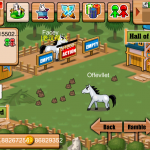 Horses gain experience and money by practicing races and racing other game players. You can earn points when cleaning your ranch as well as helping clean other horse ranches. Make sure to help the horse grow by feeding it with different kinds of food and you will want to monitor your horse’s mood and energy level. As you earn gems and coins you can purchase upgrades. Some of the equipment upgrades you can buy for the horses include saddles, different hay to feed them with and even magic skills such as wings to fly. These are all important to note as these aren’t just any races, some will include obstacles in their paths and arming with the right equipment can be the determination of a race being won or lost. There are three lineages of horses: wind, thunder and fire. Each has their own advantages such as speed and strength. A horse’s quality is also based on age, grade, mood, energy level, sprint and physical strength. All important to note when buying other horses and improving your own. What I enjoyed most was personalizing my horse. Earning money to make it a little bit better every time. The races are fun to watch but there isn’t much involvement. You are mostly a spectator unless you have purchased props to use in the race. These you can use to jump over obstacles or give you a burst of speed to get a better finish. Derby Manager has different race types you may enter your horse in. 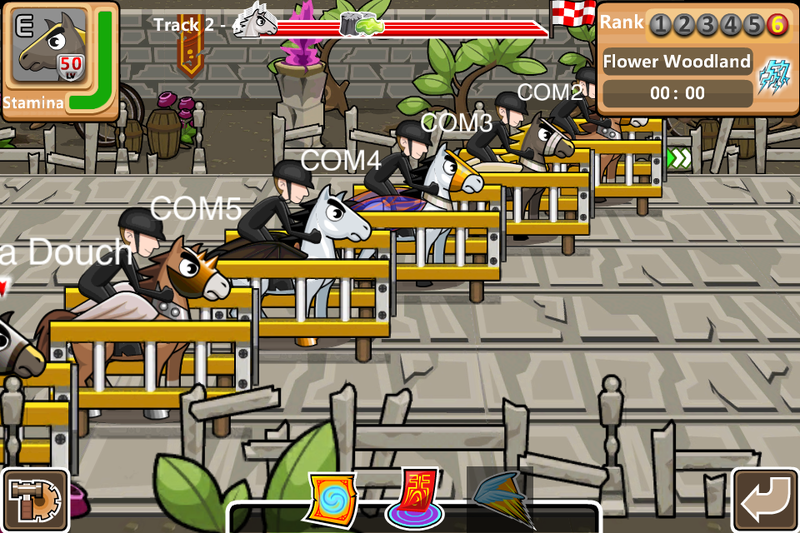 The training race within your own ranch will gain you experience and gold coins to help your horse grow. Nearby and Engagement races can be created and allow you to invite other players to race against. The last is the Official Leagues which has different requirements for horse grades and you can compete players for more experience and rewards. You can bet on the races with the exception of the training race. In the league, betting is always open, players can bet their own horses or horses they favored, then gain or lose money according to odds. Participating in an official league or betting on horses which joined the league both offer players great chance to win high bonus. 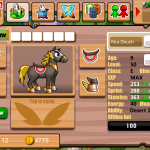 Win money and upgrade your horse with props, equipment and food to stay competitive. There are also In App Purchases as an option to buy more gems that can be used to purchase items for your horse within the game. Aside from upgrading your own horse you can stop other players’ horses as well by putting them on a Wanted List, making that horse unable to turn down any competition and possibly get injured in the process. The wanted state lasts only 48 hours, but can be a big set back to a high level competitor. This is a community based game, so you want to add your friends. The more friends, the more fun. Search and add friends with Hohool ID. Leave messages at your friend’s ranch and see who is online. Facebook and Twitter sharing is also available to send screenshots, rank and other race info. 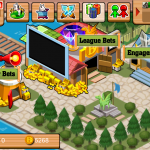 Derby Manager is a fun, competitive game that will keep players logging in day after day. The options are endless and with a big community of players, the races will never end. The app is compatible with iPhone, iPod Touch and requires iOS 4.0 or later. It has been recommended in “New and Noteworthy” of the App Store and is currently free! Great value from the intro price of $4.99. Dreambrother is also running a free giveaway campaign for a period of time, with a lucky drawing for a new iPad each day. Get all the details on their site here.